Brent, left, and Russ Bonino make a living delivering fresh produce to customers at the family’s LJB Farms. 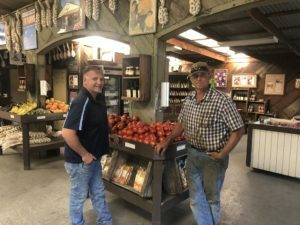 When Bonino brothers, Russ and Brent, were still little tykes running around on their family ranch off Fitzgerald Avenue in San Martin, they put their two heads together and came up with the idea to sell pears from the orchard to make some dough. Parents Louie and Judy recognized a good thing when they saw it and quickly outgrew the garage and built a small barn to sell their produce from to the locals. By the early 1980s, the business again outgrew the building and they built an even bigger barn on the same property. Today, LJB Farms is stocked with all kinds of locally and regionally produced fruits and vegetables such as corn, melons, tomatoes, mushrooms, strawberries, peaches, grapes, green beans and potatoes. There are also dried fruits, nuts, pies and jams. “It’s not a job. It’s a way of life,” said Russ, who starts his work days by 6:30-7am in the morning on most days and doesn’t stop until what’s needed to get done gets done from fueling up the equipment to replacing tires to organizing the field crew to getting the product on transport. Long before the two brothers sat at the end of their parents’ driveway to make a few bucks selling pears, the Bonino family—now 101 years in agriculture—emigrated to America from Italy. Russ and Brent’s great grandfather, Luigi Bonino, and grandfather, Tony Bonino, came to San Martin in 1917. Grandpa Tony—who farmed until he was 88 and lived until age 97—met his wife Helen (Sgheiza) from Salinas in 1918 and they raised three children (Don, Louie and Elaine) on their Gilroy ranch. The elder Bonino brothers, Don and Louie (the boys’ dad), were partners in farming for a while before uncle Don eventually went into the construction business. Louie, joined later by his wife Judy, stuck with farming and settled just north of town on Fitzgerald. Both brothers attended California Polytechnic State University in San Luis Obispo (Russ as an agricultural engineer major; Brent as an ag business major) and graduated in 1996. While the brothers’ roles in the family business have expanded over the years (although Brent said they don’t have official titles or defined roles since everybody chips in wherever they are needed), their father, Louie, “is still actively involved” and mother, Judy, continues to handle the books, payroll and accounting. “My parents are still running the show,” Brent said. The show is vast as the Bonino family farms about 750 acres, a majority of which is leased land, within a 7-mile radius of the Fitzgerald Ave. fruit stand from their grandparents’ ranch south off Leavesley Road in Gilroy to as far north as Main Avenue and Condit Road in Morgan Hill. Some of their main crops, raised by Russ and field crews of about 25 workers, remain corn, tomatoes, garlic, peppers, cucumber and squash, which are all sold in the store. In 2018, they grew 100 acres of garlic for Christopher Ranch. But even with all the urban sprawl and seemingly endless rows of new housing developments, the Bonino family has survived through the toughest of times and built memories that will last longer than the last farm standing.